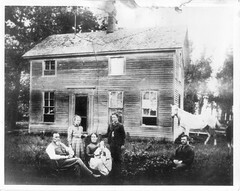 During a recent visit to Nebraska, Dad and I met with the son of Edwin Louis Christoffersen to go through family pictures. Young Ed produced a treasure from among his father’s personal effects. Edwin Christoffersen was superintendent for the Mayer-Osborn Construction job at Cordell Okla., and among his duties was the engineering of a safe and durable elevator. 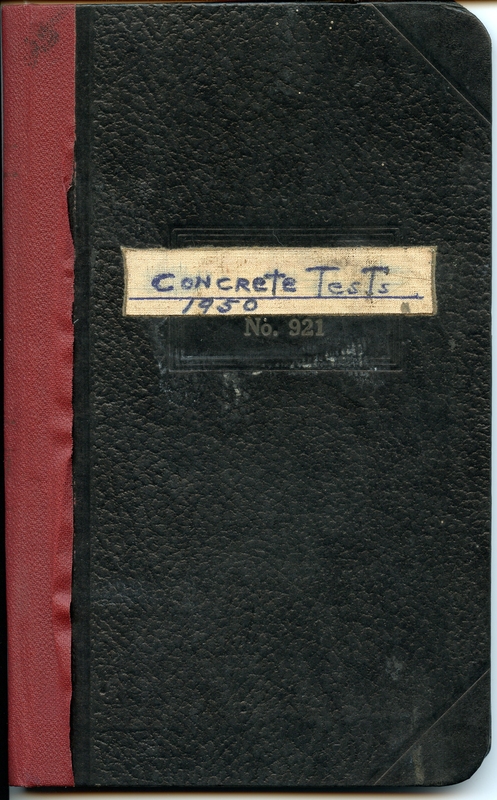 Testing the concrete from a given supplier was of paramount importance. 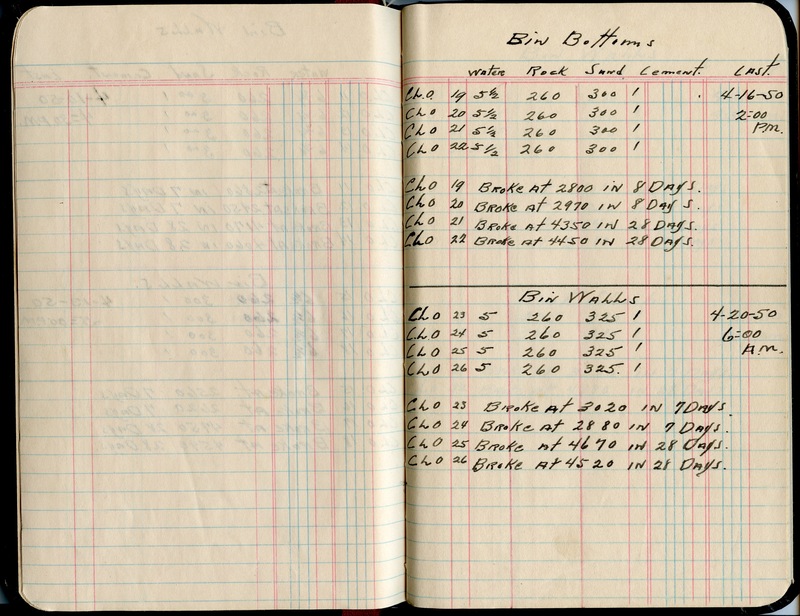 This logbook shows the results of the testing for each part of the elevator’s structure. It is a fascinating bit of engineering history, and it speaks for itself. 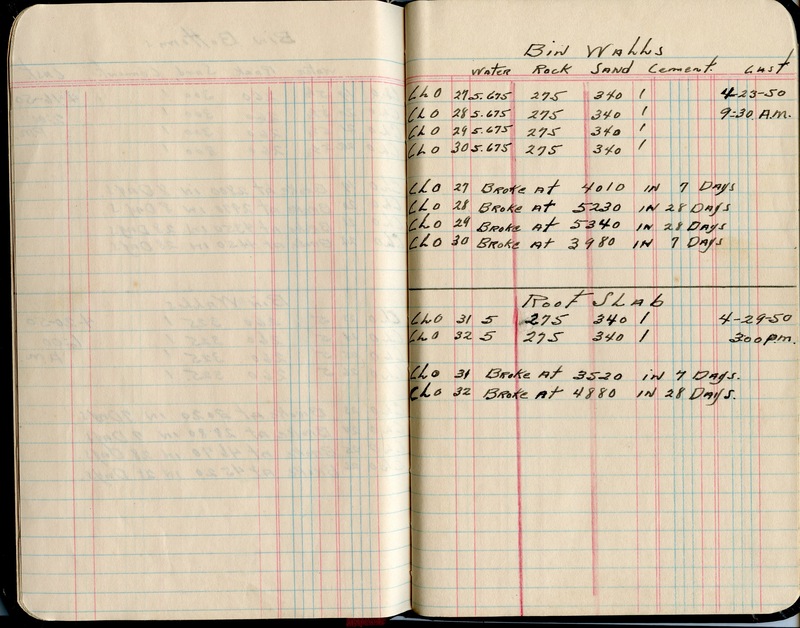 You will notice that the date and time of day was included in the calculations for each test. 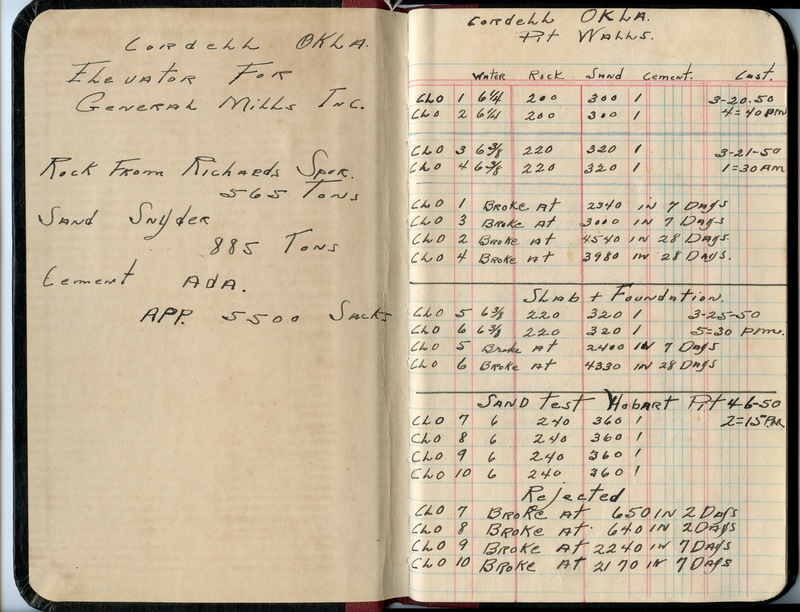 This is how we were able to determine when the Cordell elevator was built. While a number of factors were recorded for each test, it is not clear to us what each term meant. Perhaps some of our readers can explain the process to us. It is a true privilege to see some of the engineering practices in use during the 1950s, at a time when slide rules did the work of computers, yielding sufficient precision to send our astronauts to the moon in the following decade. These builders, engineers, and innovators were pioneers, working at the pinnacle of their profession. We wish to thank Ed Christoffersen for sharing this priceless piece of history. This entry was posted in Employees, Mayer-Osborn and tagged construction, Cordell Oklahoma, Edwin Christoffersen, engineering, grain elevator, Mayer-Osborn Company, slip-formed concrete. Each line is a test or “set”. The sequential numbers are the “set” numbers for tracking purposes. The book records the amounts of water, sand, aggregate and cement that make up the sample mix which the test was taken from. The “sets” were broken at 7 days to get an initial indication of the strength potential in the concrete mix. A general rule of thumb is that normal concrete mixes should reach 70-75% of their design strength in the first 7 days of maturity. The 28 day tests are required for acceptance as determined by applicable ASTM and ACI standards and manuals of practice. Thank you for your explanation–it makes perfect sense, now. 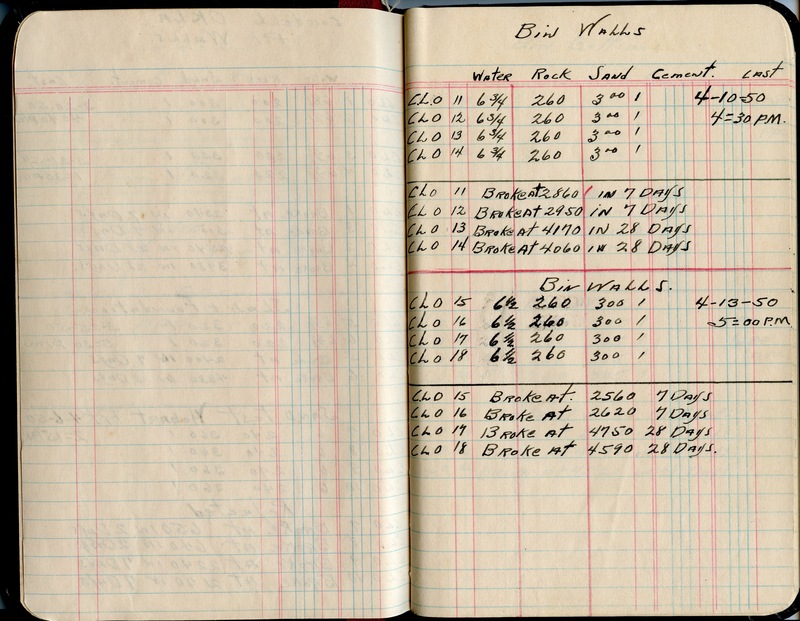 The builders had to meet a measurable standard, so this logbook is a glimpse of how they did it. Look for a future post of elevator construction standards set forth in contract language at Wauneta, Neb. in the 1950s, assuming we can make it interesting! Incredible Young Ed held on to this for so long… Indeed, it is a treasure for your research into history!